Detached House for sale in Kirriemuir | Appin House Brechin Road | Thorntons Property - Estate Agents in Dundee, Edinburgh, Angus, Perthshire and Fife. Outstanding opportunity to purchase this traditional red sandstone constructed detached town house, set within an extensive mature garden. Appin House was constructed in 1891 for Sir JM Barrie's schoolmaster and this is only the second time the property has been available to purchase. 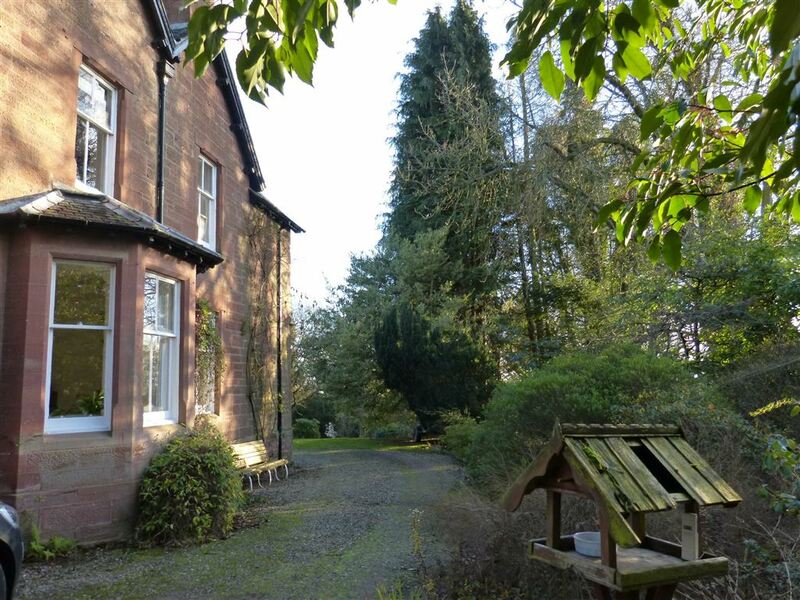 Located on the prestigious Brechin Road the property is only a short walk to most amenities including: shops, cafes, library, supermarket, health centre, bowling club, golf course, woodland walks, primary and secondary schooling. As well as being the gateway to the stunning Angus Glens, Kirriemuir is ideally placed for most Angus Towns whilst the major cities of Dundee, Perth and Aberdeen are within easy commuting distance. Dundee being Scotland's fourth largest city has all the facilities expected from a major centre including a mainline railway station and domestic airport both offering regular connections to the South of England. Appin is a handsome Victorian residence of historical interest and is undoubtedly one of the finest period homes within Kirriemuir. The substantial accommodation retains many original features; an impressive entrance vestibule with mosaic floor whilst a stained glass interior door with brass push plate leads to the reception hallway. The imposing south facing lounge features; a large period fireplace, inset Jotul wood burning stove, ornate cornices and centre rose. The relaxed family room also overlooks the front garden whilst the exquisite dining room features a bay window, ornate ceiling and open fire. To the rear, "the hub" of the property is the comfortable family/dining with Jotul wood burning stove and original flagstone flooring which also runs through the kitchen and utility room. From the family/dining there is direct access to the useful utility and the quality David Douglas bespoke kitchen which incorporates a feature two oven gas fired AGA. Ground floor accommodation is completed by a fully shelved larder, period cloakroom and study/bedroom. The upper accommodation features: a family bathroom with three piece suite with a mains shower over bath, extensive fully fitted dressing room, nursery/study and four good sized bedrooms. 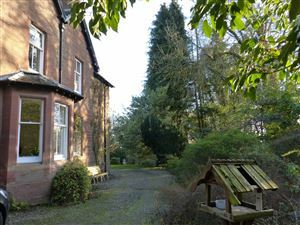 The front bedrooms offer delightful views over the front garden towards the Strathmore Valley and the Sidlaw Hills beyond. There is excellent attic space and storage throughout. The impressive list of attributes and period features include: gas fired central heating, working shutters, stained glass interior door, wood panelled doors, deep sill skirting's, ornate plaster work, period fireplaces in most rooms, "Jotul" wood burner stoves in family/dining and sitting room, "Anta" blinds, gas fired Aga, natural wood floors in formal rooms, original flagstone floors through kitchen, family, carpets, and some light fittings. The property sits within a large mature garden which extends to 4147m sq (1.3 Acres). Access is via twin wrought iron gates leading to a wrap round driveway which in turn leads to the stone constructed detached stable building. The upper garden features: extensive lawns, established trees, herbaceous borders, produce garden with fruit canes. The lower garden features small orchard, Hen run and woodland area with abundant spring bulbs. The building plot which is subject to separate negotiation is located within the lower garden, to the south of the property and extends to 1343 m sq wiIth separate vehicular access from Elm Road. Due to the extent of the garden and the secluded nature of the building plot there is little visual or amenity impact on the main residence. The outline planning consent is for a 1.5 storey detached dwelling. Full details can be found at www.angus.gov.uk reference 18/000578/PPPL. Appin House offers the potential buyer a rare opportunity to purchase this elegant family residence of considerable character and charm located within central Kirriemuir. There is also great potential for multi generational living. For those who would prefer a less extensive garden, Appin House is available to purchase with less ground.